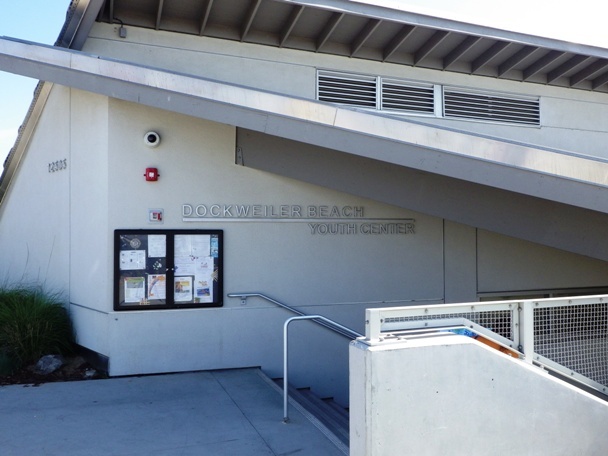 Dockweiler Beach Location - The beach entrance is located in Playa Del Rey at 12000 Vista del Mar (where Imperial Highway meets the Pacific Ocean). 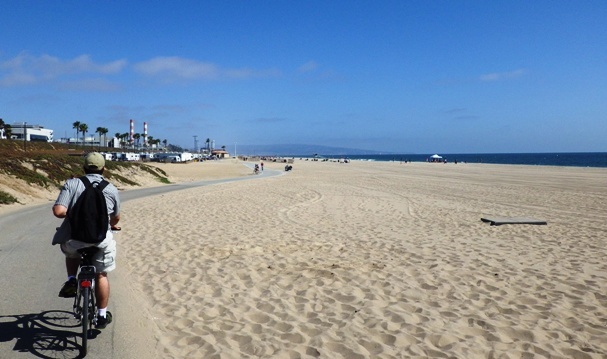 The beach is wide and long and starts from Ballona Creek and extends South to the area just before the Chevron plant where El Segundo Beach is - a rocky section of beach where most of the surfers can be found. To get to regular automobile parking from the entrance at Imperial Highway, turn right and there are many lots along South Marine Avenue. There is an additional parking lot at the end of Grand Avenue off of an access road near the Chevron plant (close to Manhattan Beach). Parking fees run from $3 to $13 per day. To get to RV Parking at the beach, turn left after entering from Imperial Highway. Reservations are required at least 2 days in advance for full hook up spots and prices range from $55 to $65 per day with additional charges for extra guests, pets, holidays, dump station use, and reservations. The RV park is a great place to stay steps from the beach sand and with a great view of the ocean. Dockweiler Beach Camping- There is only RV parking available. No tent camping or visitor parking is available at Dockweiler RV Park. The RV park does have full hookups, picnic areas with tables and benches, showers, laundry facilities, and BBQs (personal BBQs are allowed here as well). There are volleyball courts available to get a game going. it is also located next to the beach bike path - so be sure to bring bikes, tricycles, roller blades or skates to enjoy cruising in the sun by the sand and surf while camping out. Surf fishing is allowed on the beach. 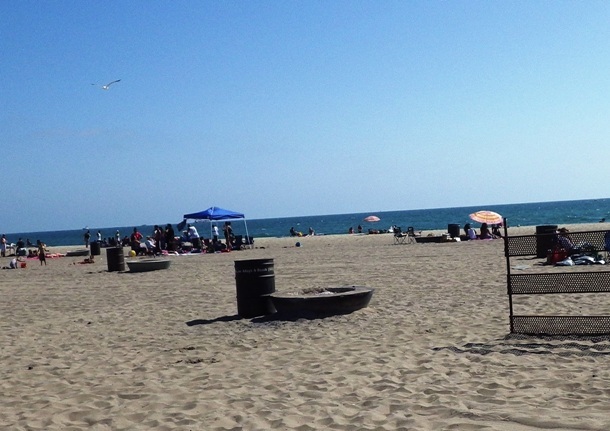 Dockweiler is the only LA County beach location where camp fires on the beach are allowed - there are bon fire pits on the beach to accomodate visitors. 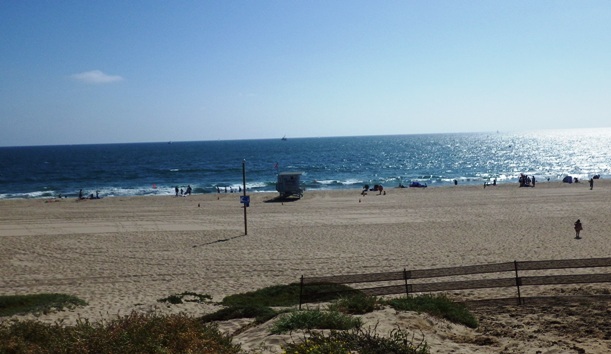 When you are ready to get an RV trip planned to the beach, online reservations for LA County - Dockweiler can be made here: Dockweiler Reservations by clicking on Camping\RV and selecting Dockweiler from the drop down list. Be sure to check out the rules and regulations for RV camping at Dockweiler here: Dockweiler Rules. 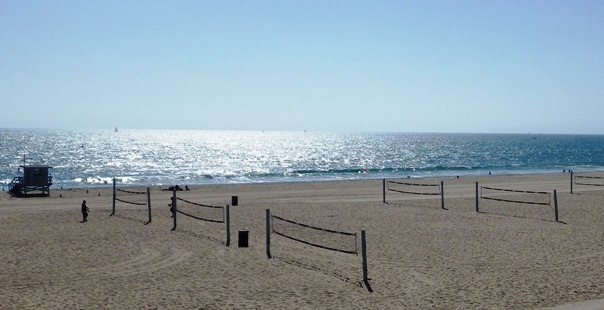 Dockweiler Beach Activities- Besides the usual games of volleyball, football, or frisbee on the sand or boogie boarding, swimming, or playing in the surf, there are a few interesting beach activities that happen at Dockweiler Beach for people to enjoy. 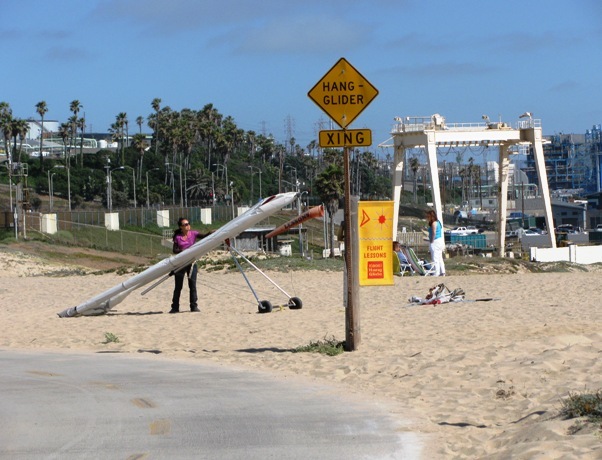 Hang Gliding: Windsports offers hang gliding lessons off of the 30 foot bluff at Dockweiler (near the Youth Center) from Wednesday through Sunday during the week. There are 3 West facing areas off of the bluff for beginners and novices to launch from with the aid of an instructor. Depending on which package you purchase, you will spend between 2 to 4 hours learning how to launch and glide over the sand at Dockweiler in 4 to 7 flights. To make reservations for Hang Gliding lessons, contact Windsports. Nature Walks: The Los Angeles Audubon Society hosts nature walks from the Dockweiler Youth Center on certain Saturdays from 9:00 am - 10:30 am. The walks are free and the parking fee is reduced for those participating in the walk. While on the walk, binoculars are provided for your use and you will see many birds and items of beach ecology interest along the way. Surf Fishing: If you have a current California Fishing License, you can bring your fishing pole and bait and fish for perch, halibut, and more from the shore near the surf. If you would like to learn how to fish from the shoreline, the Los Angeles County Department of Beaches and Harbors offers classes on Saturdays and Sundays in April and May in the mornings. The classes include fishing poles and bait at no charge. Groups are limited to 10 participants and anyone over 16 yrs old must have a valid California Fishing License. Kids Craft Classes: From May through September on Saturday mornings at the Youth Center, there are free classes for kids to make arts and crafts that are called "Make It and Take It". The classes are staffed and part of the Los Angeles County Department of Beaches and Harbors free, public classes. Plane Watching: The West end of Los Angeles International Airport is less than a mile from the beach which makes it a prime, close up viewing spot for all airplanes taking off over the ocean. From giant 757 airplanes to smaller twin engine planes, you feel like you can almost touch them as they pass overhead towards the ocean. Bike Riding & Skating: Bring your bike or skates down to the beach and enjoy the longest section of the beach bike path in Playa Del Rey - almost 5 miles from Ballona creek to Manhattan Beach. There is a rental place in a structure right off of the path and adjacent to one of the parking lots North of the RV Parking Lot at Dockweiler. The building is currently painted blue with the name of the man for whom the beach was called: Isadore Bernard Dockweiler.